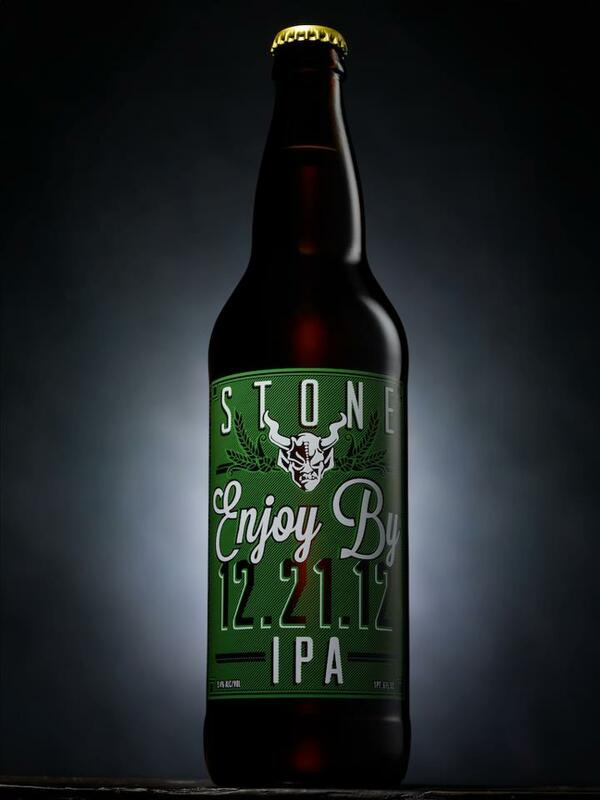 By Urban Beer Nerd	Beers, Breweries, IPAs, News, Rare Beer Alert, Stone Brewing Co.
Today Stone Brewing Co. announced via Facebook and Twitter that its new Enjoy By IPA is now shipping to ten states. Stone Enjoy By 12.21.12 IPA is the third Enjoy By IPA the brewery released this year, and it will be available in the following markets: Southern California, Central Coast California, Northern California, Illinois, Indiana, Iowa, Kentucky, Massachusetts, Missouri, New Jersey, New York City and Texas. “STONE ENJOY BY 12.21.12 IPA IS ON ITS WAY! The initial Enjoy By 09.21.12 IPA was available only in Southern California, Chicago and New Jersey, and the second version, Enjoy By 11.09.12 shipped only to Colorado and Ohio, so Enjoy by 12.21.12 will be the most widely distributed version to date. And I’m extremely glad to see it will be hitting my home state of Massachusetts. She will be mine. Oh yes, she will be mine. Tagged beer, beers, craft beer, Enjoy By 12.21.12 IPA, Enjoy By IPA, IPA, IPAs, Stone Brewing Co.
Intrigued by creative blends of beer … thanks for sharing! No problem. Stone makes amazing IPAs, and I’ve heard nothing but good things about these Enjoy By IPAs. So I’m anxious to try the new one. WOW!! Smells like Hopslam, great westcoast DIPA, fresh and might tasty! I literally just finished a bottle of my own. I picked up a a handful of them today. I was kind of worried it wouldn’t live up to all the hype. But I think it did. Fantastic double IPA. Very complex, but balanced too. I’m impressed.